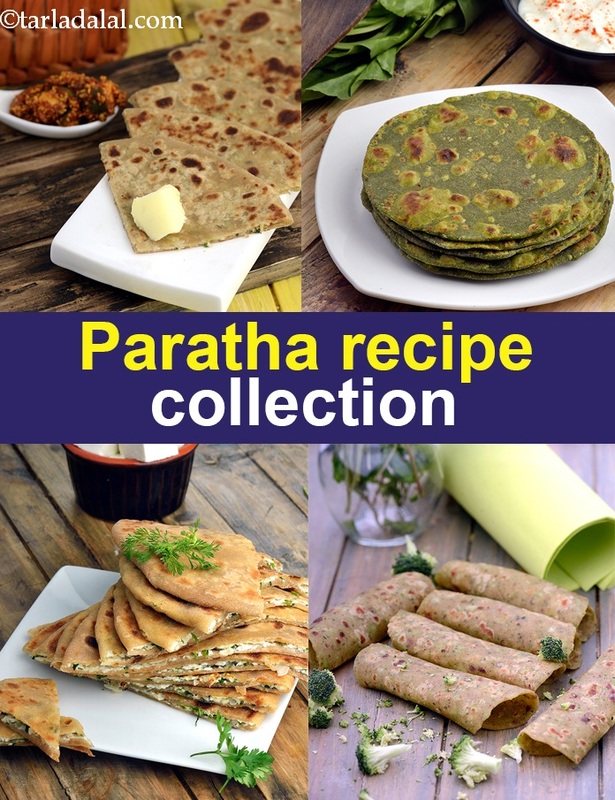 Paratha Recipes, Veg Paratha Collection. Paratha are unleavened flatbreads made by adding all the ingredients to the dough, or by stuffing them. They help our mom’s to make deceiving food to make us eat all the vegetables which we wouldn’t have eaten otherwise. They are a healthy, quick option for tiffin. A good stuffed paratha makes a perfect breakfast or heavy meal. They can be eaten with curd, pickle, curry or as it is. Paratha can be simply made using flour, some spices or stuffed with vegetables. Paratha are rolled on a wooden elevated board called the chakla and the rolling pin is called belan. The skill of cooking paratha lies in stuffing them without breaking it. Beginners can obviously not manage the stuffing, rolling and cooking so, you can simply roll and keep them aside and cook all of them together. Here is a list of amazing varieties of veg parathas which you must try! North Indian parathas. North Indians especially Punjabi's relish heavy meals of subzi and paratha or tandoori flatbreads. Lachha paratha are the most famous North Indian paratha, which are layered and crisp. We have added some cottage cheese (paneer) to make a more nutritious version of them. Also, dairy products are abundantly available in the northern region. Treat your guest’s with these amazingly delicious, melt in the mouth Reshmi paratha. Serve with some Punjabi gravy and sliced onions. You can even make myriad of vegetable paratha recipes using different vegetables and spices. High in fibers and proteins, these Spinach paratha are the most common type of paratha. The stuffed cottage cheese makes them a sumptuous meal. The goodness of broccoli along with some dried herbs makes an amazing combination to make your children eat broccoli with the paratha. You can even try these healthy and delicious stuffed paratha made using all the vegetables available at home. Don’t forget to add curd to the dough to get a softer texture in the Paushtic Paratha. We all love gluten free parathas. Gluten - a protein found in wheat, semolina (rava) and its products is not suitable to everyone. This condition, called gluten-sensitivity, requires one to eat foods without this particular protein. Our website has a huge collection of gluten-free recipes. Add some goodness of green leafy vegetables in your diet and make these wholesome gluten free Hariyali paratha. Clueless about how to add millets to your daily diet? Make these three grain gluten-free paratha and boost your nutrient content. You can even make these deliciously, healthy green peas paratha. Serve them with some curd or pickle. Check out more gluten free parathas ! See our dal paratha recipe collection. You can even incorporate dals in your meal by making stuffed dal parathas. Green moong dal is a rich source of protein and fibre and when combined with spring onions , it makes an exotic combination. The green moong dal and spring onion parathas are crispy in texture and extremely nutritious. If you are not a fan of spring onions then try this simple rich in protein, heavy on stomach, these moong dal paratha best go with green chilly or mango pickle. It can also be created using some leftover dal.The combination of dal with cabbage works really well. Try this unique cabbage and dal paratha. Cheese paratha collection. One of my favorite paratha recipe is the cheese paratha. Be it grating them over a simple paratha or mixing it with the stuffing mixture of paratha. I love them in all forms. Also, cheese is loved by kids a lot. Try your hands on various cheese paratha recipes like cheese paneer paratha, cheesy cauliflower paratha or broccoli and cheese paratha. Enjoy our Paratha Recipes, Veg Paratha Collection and other paratha, roti recipe articles below. Though not very commonly used, rajgira flour combines beautifully with potatoes in these peppery parathas. The potatoes ensure that the parathas remain soft. Serve these parathas with spicy green chutney and curds. While the mint sauce is the highlight of the dough, the unusual combination of vegetables such as cabbage, potatoes and corn marks the stuffing. Common but effective ingredients such as chillies, lemon juice, coriander and garam masala make the parathas truly irresistible. Many varieties of parathas provided by Tarla Dalal. I have learnt making good aloo paratha, paneer-methi, dal paratha, paratha with 2-3 grains... Now paratha breakfast on Sunday is mandatory at our home. Whole family enjoys having garama-garam paratha with curd, chunda or pickle. Babuji, my father in law loves the parathas i make. Sometimes he have the leftover parathas for his lunch with subzis or raitas. I am very proud that i make my family happy. Love your collection of Veg Parathas. We love your Gluten free paratha collection and Punjabi Parathas.